Packless: Unlike a ball valve there are no dynamic seals to wear or leak and no shafts that penetrate the pressure boundary. This simple design means less maintenance and more reliability. 1. Solenoid operated: Giving you the ability to utilize inexpensive controls for remote operation, no need for costly air systems, and a lightning fast response time (less than 50 ms). The low power coil means you don’t need expensive relays and implied simplicity through direct PLC operation. 2. Bar stock body and 316 SST Construction: Take your process to Higher Pressures with quality materials and a wide range of fluid compatibility. 3. Cartridge: Want to save money on maintenance? The cartridge design allows the valve body to stay in-line which yields minimal down time, reduced labor costs, and reduced spare inventory expenses. One part, one tool, and one minute has you back up and running. 4. 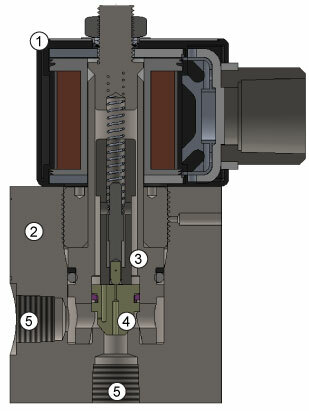 PEEK Piston: Allows for a wide range of fluid compatibility and has the unique benefit of sealing well over a diverse range of operating pressures. You can now get bubble tight sealing with a material that is durable and robust. 5. Multiple Configurations: With both Normally Closed and Normally Open operations available, the valve offers great design flexibility for your fail safe conditions or ESD applications. Offering multiple coil and body connection options allows you to easily select the one that works for your domestic or foreign application and design your system around the most cost efficient connection available.